A rare, multicolored Roman mosaic from the second to third-century AD is being uncovered at Caesarea National Park in Israel. The mosaic floor was discovered in recent months in an antiquities authority dig and was carried out as part of work to reconstruct a huge bridge at the entrance to Caesarea from the Byzantine period, the period after which the Roman Empire adopted Christianity. The mosaic was excavated during a larger dig by the Israel Antiquities Authority and the Caesarea Development Corporation, in cooperation with the Israel Nature and Parks Authority, which has uncovered part of an opulent building dating back 1,500 years to the Byzantine period. 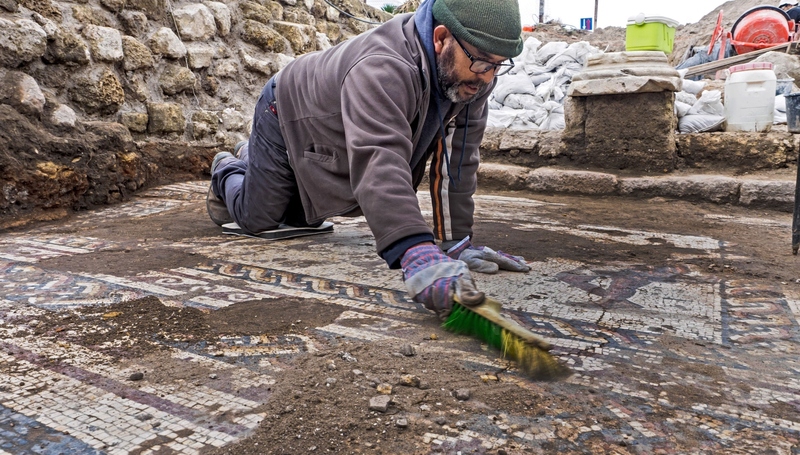 To the archaeologists’ surprise, under the imposing Byzantine-era structure they found the spectacular mosaic from an even earlier building dating back about 1,800 years. “This colorful mosaic, measuring more than 3.5 x 8 meters, is of a rare high quality. It features three figures, multicolored geometric patterns and a long inscription in Greek, which were damaged by the Byzantine building constructed on top of it,” said Peter Gendelman and Dr. Uzi ‘Ad, directors of the excavation for the Israel Antiquities Authority. Jacques Nagar, head of the Israel Antiquities Authority Art Conservation Department, said that this rare mosaic was executed in a sophisticated style found in places like Antioch in Turkey. The images were made using about 12,000 stones per square meter. The Israel Antiquities Authority Conservation Administration is now working to preserve the mosaic and make it assessable to the public. Caesarea attracts more than 700,000 Israeli and foreign tourists every year, mainly due to its many well-preserved Roman-era ruins, among them the altar of a temple built by Herod 2,000 years ago; a mother-of-pearl tablet etched with a seven-branched candelabrum, and the statue of a ram, which was a symbol of Christian congregation in the Byzantine period. Originally posted at Israel 21c.